Images of the Country will charm your customers. 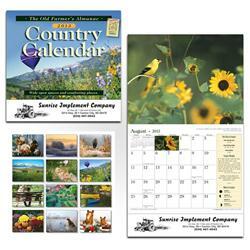 Customize this Farmer's Almanac Country Wall Calendar with your company's logo. 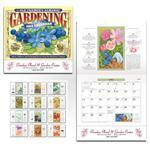 A 13-month 4-color scenic wall calendar,great for grocery stores, nurseries, farm supply, banks, and your customers! Beautiful full color country scenes! These thoughtfully designed wall calendars from the archives of The Old Farmer's Almanac are a great way to promote your business with a gift that will truly be appreciated and remembered. Made in the USA. Price shown for stapled calendar with one color imprint. 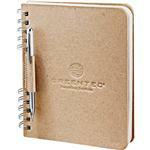 For spiral bound add $0.07 per piece. Full color imprint available - inquire! Available Colors: White Background with Full Color Images. Production Times Available: Standard 7-Working Day Production with Paper Proof. Dimensions: 10.5 inches x 18.25 inches open, 10.5 inches x 10 inches closed. Available Imprint Options: Standard Imprint for Price is in black. Additional Color is $24 setup plus $0.06 per piece running charge. Full color imprint available. Personalization Available. 13 month calendar, 60 pound gloss text and gloss coated cover. Plain envelopes at $0.14 each and $0.22 inserted. For spiral, add $0.07 per piece. 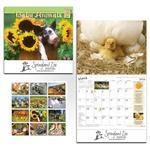 Full custom calendars available with custom images available at 500 pieces or more - Inquire. Call us for your custom calendar project at 888-332-ADCO (2326). Approximately 29 pounds per 150 pieces.